A contemporary embroiderer's journal - of images, thread, fabric, colours and textures that evoke living, through the language of stitch. 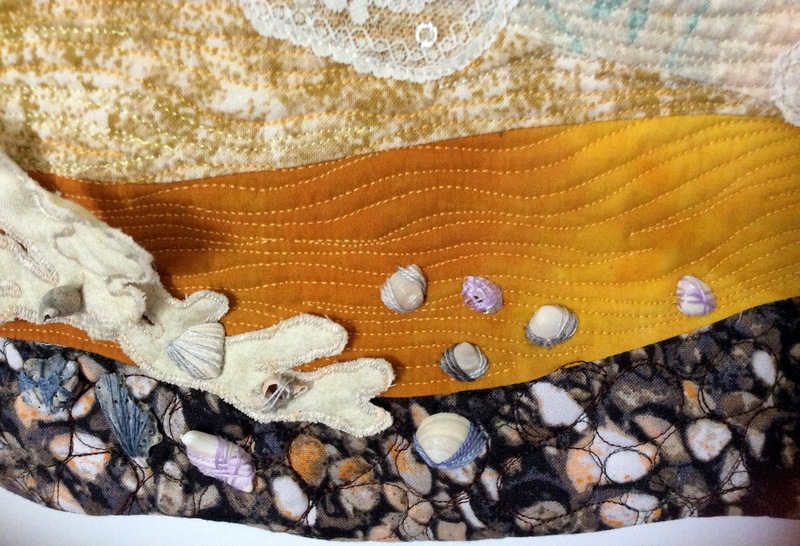 shells, sheer fabric, threads, sequins and glass beads. Quilting. There’s a word that breathes life into my soul! 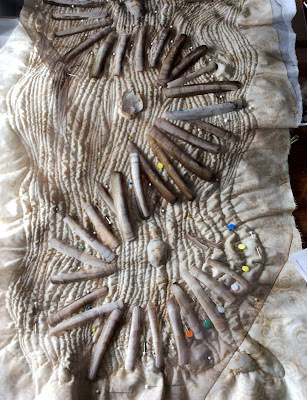 The piecing together of fragments and leftovers to make something ‘new’ and beautiful. I am not an artist. I stitch to pray and to grapple with scripture (like Jacob, ‘I will not let you go until you bless me!’). I experiment and, as with all experiments, I learn from those that don’t work, which become the unfinished, the UFOs that sometimes haunt me. hand-made and hand-smocked for me. I was born in a home for unmarried mothers in the late 1950s. I write this sentence knowing that it doesn’t convey the pain, shame and cruelty my birth mother endured. At six weeks old I was removed from every trace of her and my heritage, and given a completely different life, on a Lincolnshire farm. The fields around me formed a changing patchwork of colours, green in spring, apart from the beautiful wild golden fields of daffodils, growing in the flat Dutch-like landscape. In autumn the vista changed to the golden-white of the ripe corn, and then the rich red brown of newly turned fertile soil after ploughing. Maybe that’s why I spend my time diligently piecing a colourful patchwork of fabric together! 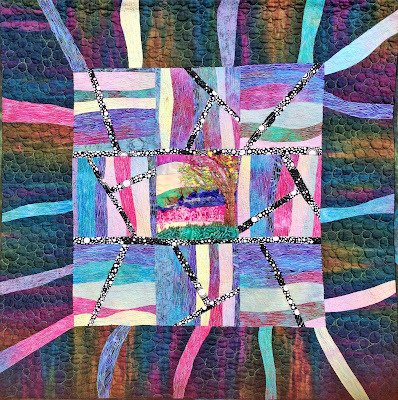 after a quilt retreat in Colorado led by Ricky Tims. Made using hand dyed cotton, hand-dyed silk velvet, and beads. 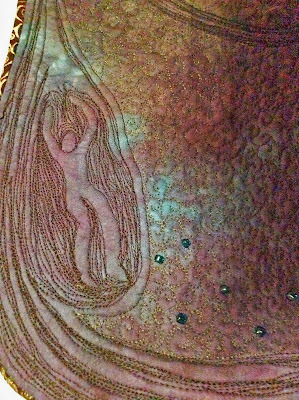 hand and machine embroidery and hand beading. 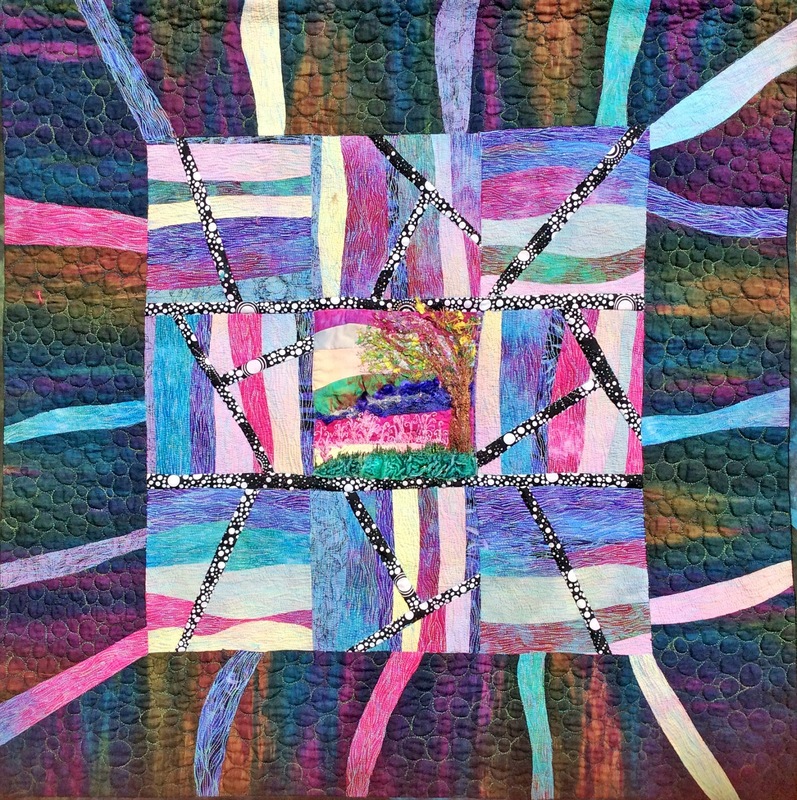 When I show my quilts (mainly to church groups, those I hope will ‘get’ something of what I am trying to do), I am always asked two questions: ‘How long does it take to make one of these?’ And ‘How did you first start quilting?’ The first question is unanswerable. Each project takes my whole life, and everything I have experienced, sometimes I cannot finish a project for years because I haven’t yet acquired the skills I need for it. The Path to Heaven (close-up) . 2013/14 . But it is easy to explain how I started. I remind my audience of ‘Golden Hands’, a long-running series of UK magazines from the 1960s and 70s. These magazines (cheaply bought in bulk from the local newsagent when they were out-of-date), with their clear instructions and good illustrations were my teachers, along with my adoptive mother, who was an exquisite needlewoman and knitter. 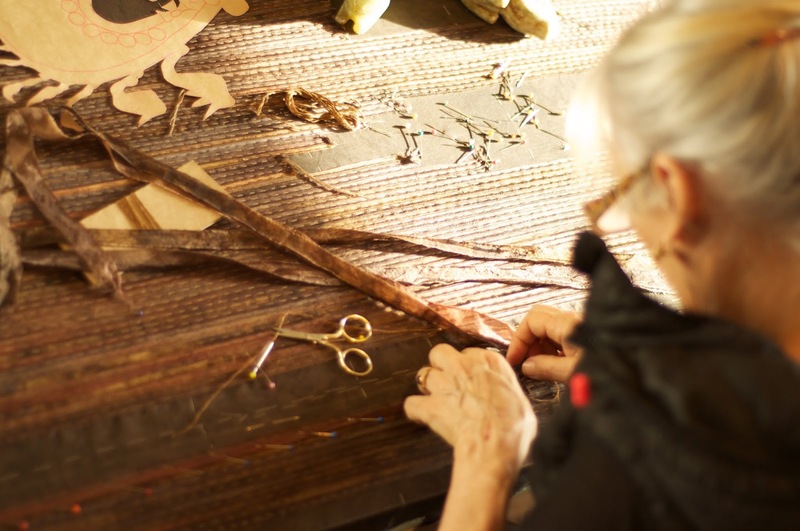 She had been orphaned at 16, and mainly picked up her skills from friends and their mothers. It enabled them all to creatively make more of their ration coupons during the Second World War. She lived in lodgings for some years before her marriage, having moved from the urban sprawl of Bradford to the small Lincolnshire town of Louth to be near her older brother. One particularly talented friend of hers became my godmother, and made beautiful smocked dresses to celebrate my arrival in the family. As a child. I didn’t have the patience to master my mother’s skills, too fond of time spent with my head in a book! And I was always one for speed over accuracy – she described my dress-making as ‘blowing things together’! Living on a farm everything had a practical purpose, no cross-stitch samplers for us! I sewed to make clothes. Patchwork was putting leftover scraps and bits from the rag-bag together – not that I actually made much with them, they were ongoing projects, a bit like life. 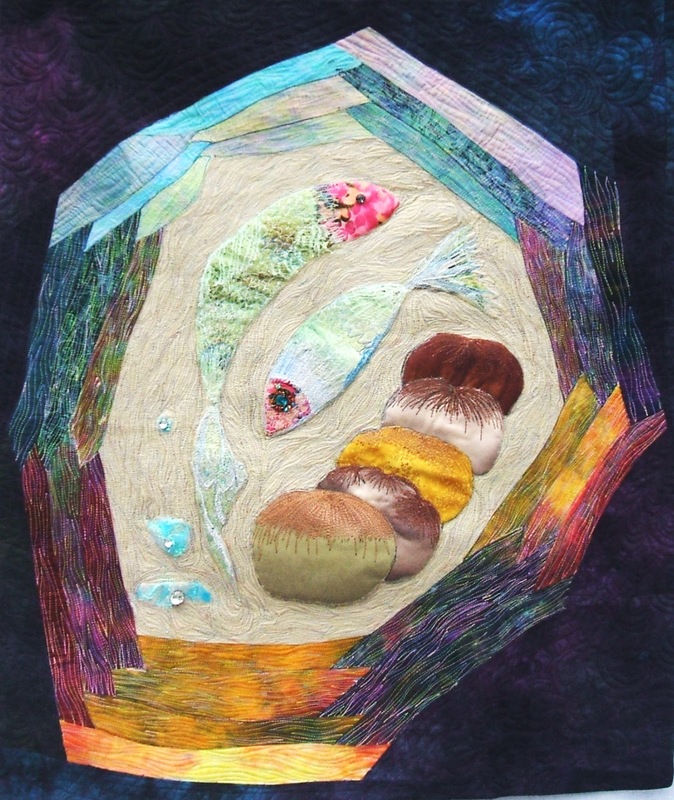 Loaves and Fishes wall-hanging, 2012 . 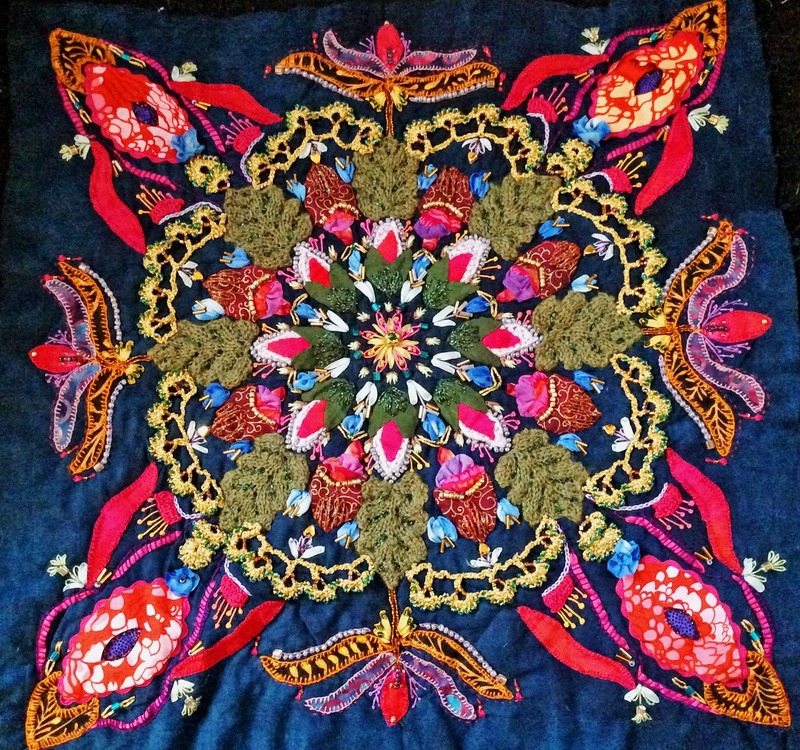 Exhibited at the 2013 Sacred Threads exhibition in Virginia (USA). to come to Jesus and give him what we have and allow him to use it for others. 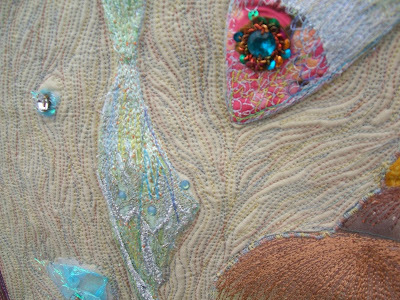 not loaves and fish!” Using cotton, mixed fibres, sequins and lace. Techniques used include applique, piecing, hand and machine quilting. Life. Which took me away from the farm and the countryside. Which made me choose between art, English, and science. At 18, in 1977, I chose science, went to University in Leeds to do a BSc in Pharmacology, and then into a job in science publishing. At least I could be creative with the use of words, and this was the closest I could get to stitching together the disparate drivers in my life. Loaves and Fishes wall-hanging, 2012 . close-up. 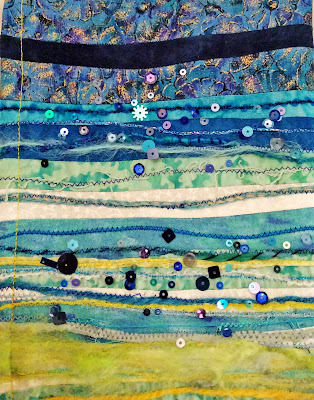 Using cotton, mixed fibres, sequins and lace. But what about faith? That I certainly didn’t get from my adoptive family, who were occasional reluctant attenders at church at best. But it has always been the foundation, the bedrock of my life. As a child from the age of seven I used to walk to where the long drive of the adjacent farm ended, to be collected for church and Sunday School in the local town. I remember my surprise when I began to realise that not everyone talked with God as I did. Even as a child I made my own rituals to keep me safe. Detail from a quilt made for the school where my daughter taught. Begun in 2008, finished in 2017. I wanted the children to have something comforting to cuddle under in their ‘Reading corner’. Cotton, machine pieced and quilted. I grew up, married, and our family grew with our first child being born in 1988. My sewing kept me (relatively) sane, and then in 1993 we went to Texas. The (UK) Cambridge-based company my husband worked for wanted him to relocate to Austin, so when he was needed in the US for the launch of a project the family went too, to experience first-hand a little of what living in America was like. My two older children were three and five, and it wasn’t an easy visit until I met the quilters. story of Jonah being swallowed by the whale. Techniques are machine quilting and hand sewing. I had braved the Austin traffic to drive to a Quilter’s Guild meeting to hear Doreen Speckman speak. A wonderful evening, and beautiful, inspiring quilts. Everyone was kind, but I was shy and out of my depth. At the end of the evening, I inadvertently left through the wrong door and, disoriented, couldn’t find where I had parked my car. An enormous white Cadillac drew up alongside me, driven by a very small lady who could just about see over the steering wheel. With her help I found, not only my car, but laughter and loving friends who sustained me during the rest of the visit. My remaining time in Austin was swept into sewing days with my new-found friends, who even lent me a Singer Featherweight to use during my visit. I still have the ‘watercolour’ quilt pieced on that machine. 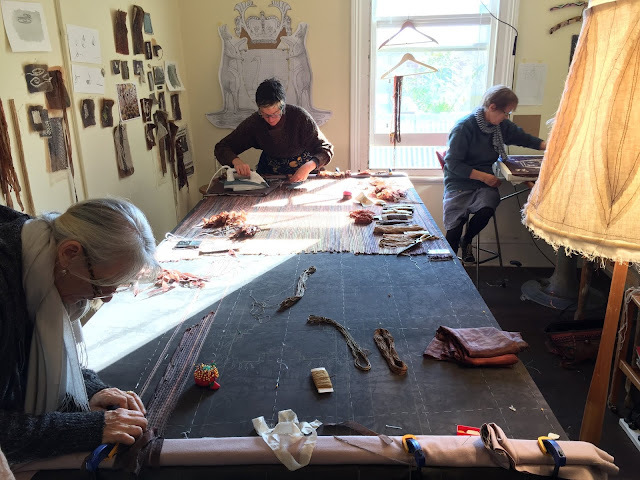 They shared fabric with me, and taught me about American strip-piecing. They were greatly amused by my Laura Ashley fabric laboriously pieced over paper hexagons, which really wasn’t the ‘done’ thing in 1990s America. 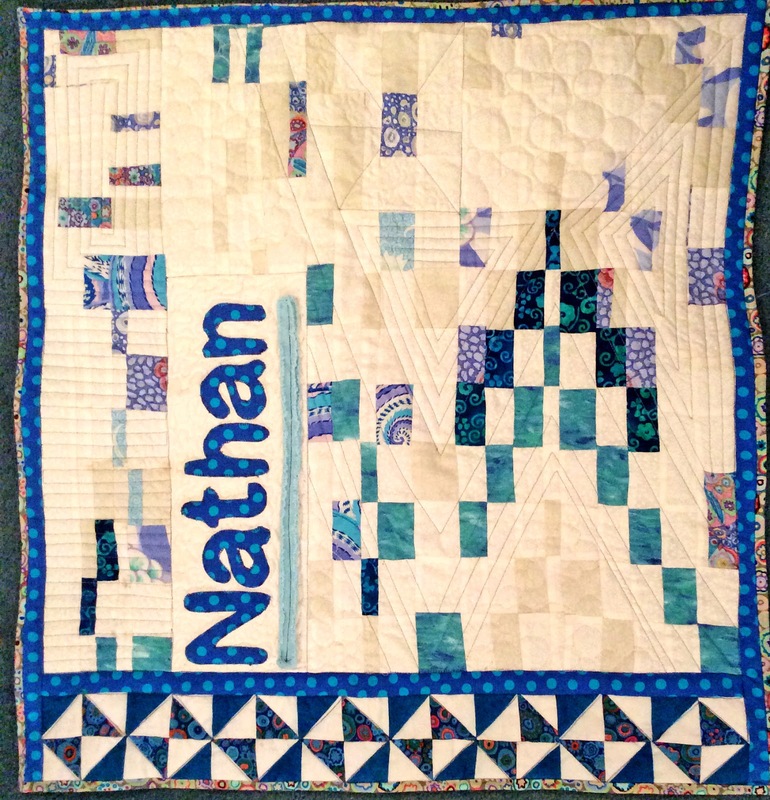 Baby quilt made for a church fund-raiser (2017). After a few months, I came back to the UK having realised that I was too European to thrive in America. There’s quite a gap between the pioneering spirit of America, and the deep historic rootedness that I had discovered in myself. During our visit, I reacted by becoming more English as the days went on, and was in danger of demanding cucumber sandwiches with my Earl Grey tea at 5.00pm each day! But I came back having been well and truly bitten by the patchwork bug. 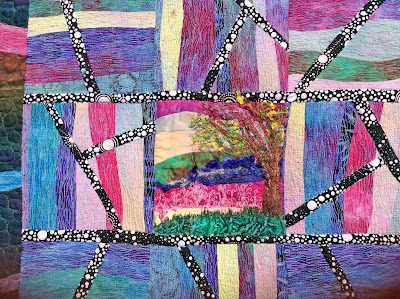 In 1995 I enrolled on a 2-year, City and Guilds adult-education course on Patchwork and Quilting, learning technique after technique, grappling with art and design, and ignoring the lectures on colour (I value my innate colour sense, and didn’t want to be ‘taught out’ of using my instincts). My third child arrived early, just before I finished the course, and I patched and pieced my chaotic life together. I pieced through a sudden move from Cambridge to York. I sewed through loneliness of being uprooted from a village to city living, and medical emergencies that spiralled as my both my father and mother’s health deteriorated, and my brother had a liver transplant. And then I began training as a Spiritual Director. 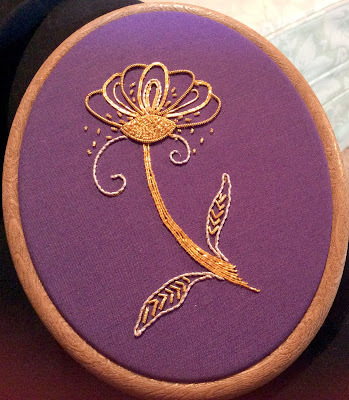 silk ribbon embroidery, applique, (all hand-stitched). ‘Draw Hope’, was our first assignment for the course. So frustrating, as I have the same innate ability to draw as a giraffe. 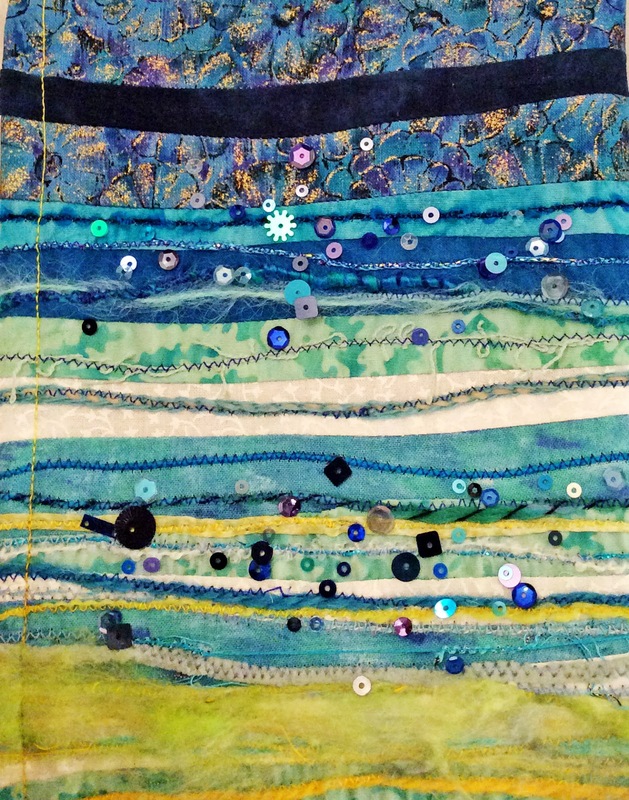 I went home, pieced-together ‘Hope’ from fabric and took it to the group a couple of weeks later. Something astonishing happened. Everyone related to quilted ‘Hope’ from where they were, they saw things in the piece that resonated for them, but which had not been part of my intention. 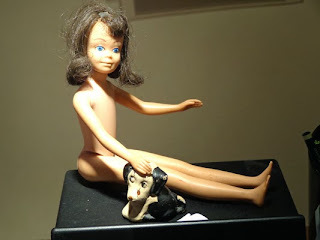 I suddenly became aware that I could connect visually, spirit to spirit, in a completely different way. I could ‘speak’ my soul in cloth. After a long illness my brother died, and stitch became my only prayer as I walked through grief. The slow journey to priesthood quickened in me and I sewed my spiritual autobiography (I’m not sure this is what my tutors expected when they said we could submit the assignment ‘in any form’). I designed the silk stole in which I was ordained Deacon, and which I wore again when I became a Priest a year later, in 2005. 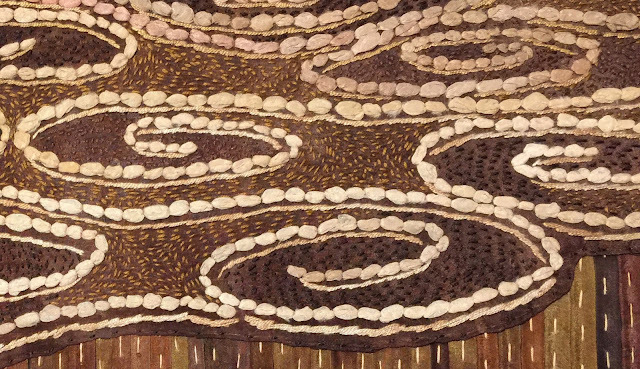 Safe to shore (close-up) wall-hanging (2017). Made as an example piece for a retreat I shall be facilitating later this year. Cotton hand-dyed and commercial fabrics, shells, lace and glass beads. 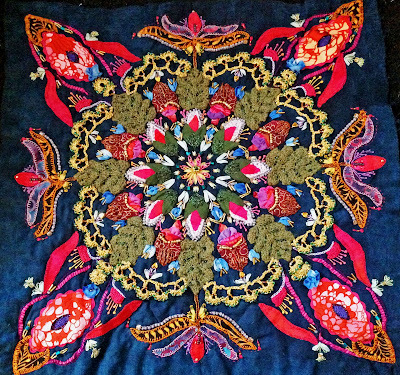 Techniques include piecing, applique, hand embroidery and machine quilting. 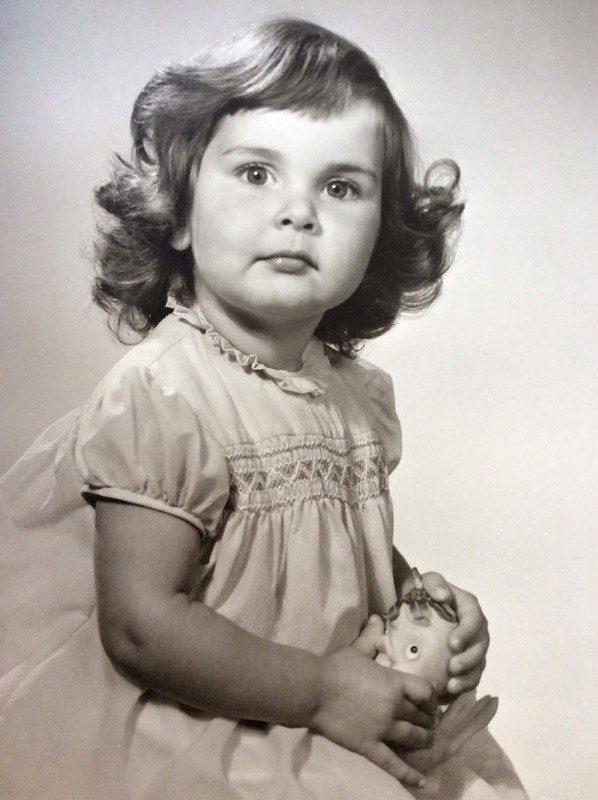 I stitched through my three years as a Curate, which is the initial training post that all Church of England clergy take up, it felt a bit like being a Priest with training wheels! I continued to stitch through the challenges of being a hospital chaplain in a deprived ex-fishing town, the post I went to when my 3-year curacy ended. I stitched through my own tears when stillborn babies were born in the hospital to very young couples, or when I accompanied and prayed for patients and their families who struggled to come to terms with the realisation that life is ending. Sometimes I helped family members while away a long bedside vigil with stitching and prayer. 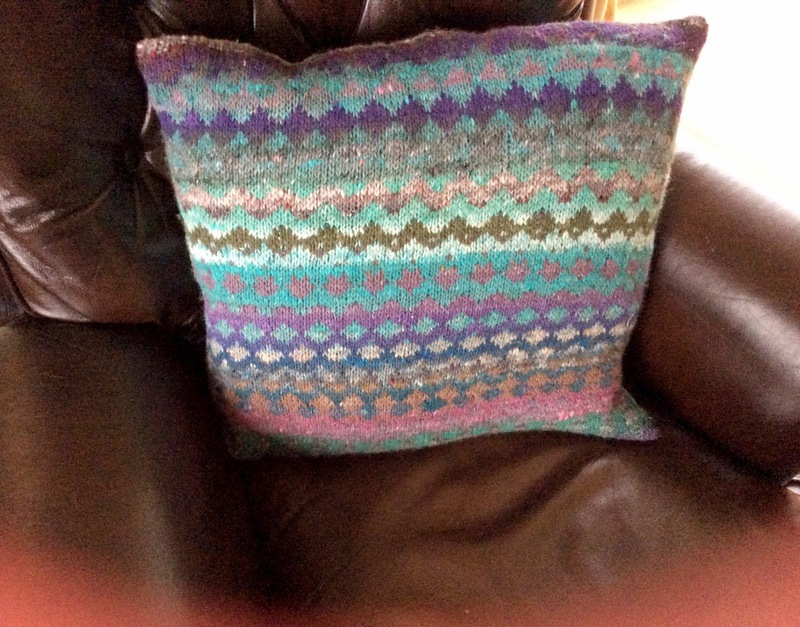 Sitting at my own father’s bedside as he lost his battle with cancer I took up knitting again, the companionable silence that fell with the rhythmic click of the needles as I knitted socks had a calming effect on us both. A fellow priest’s description of the difference between painting as art and as prayer released me to share my spiritual musings in stitch with others. ‘Art’ had an external value, it could be ‘judged’, given a pass or fail, sometimes it wasn’t ‘good enough’. But prayer is about my connection with God and the life of the Spirit, there is no judgement in it, it is always good enough for God, and sometimes it may have something to say to other people as well. Creativity seems to flow across disciplines and is many people’s main connection with the Creator God. Encouraging and fostering creativity in craft enables people to be creative in other areas of their lives. 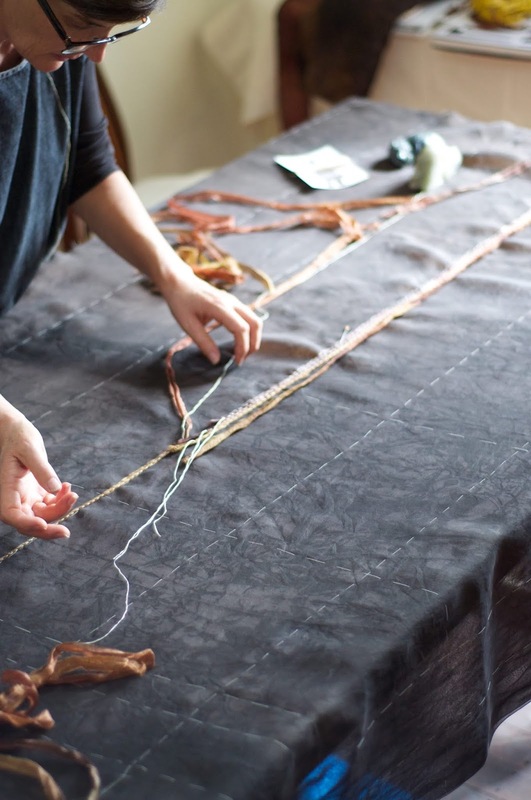 Learning stitching can help someone find a new pathway through grief, or the rhythm of hand-stitching or knitting can enable the quiet rhythm of prayer. My congregation in Waddington have, I hope, benefitted from events that involve creativity - cutting and sticking for the little ones, colouring, card making, origami or sewing for the more mature in the congregation. We mark St Michael’s day (our patron saint) each year with an impressive celebration of dragons and Saint-inspired crafts before a short service and simple shared meal. 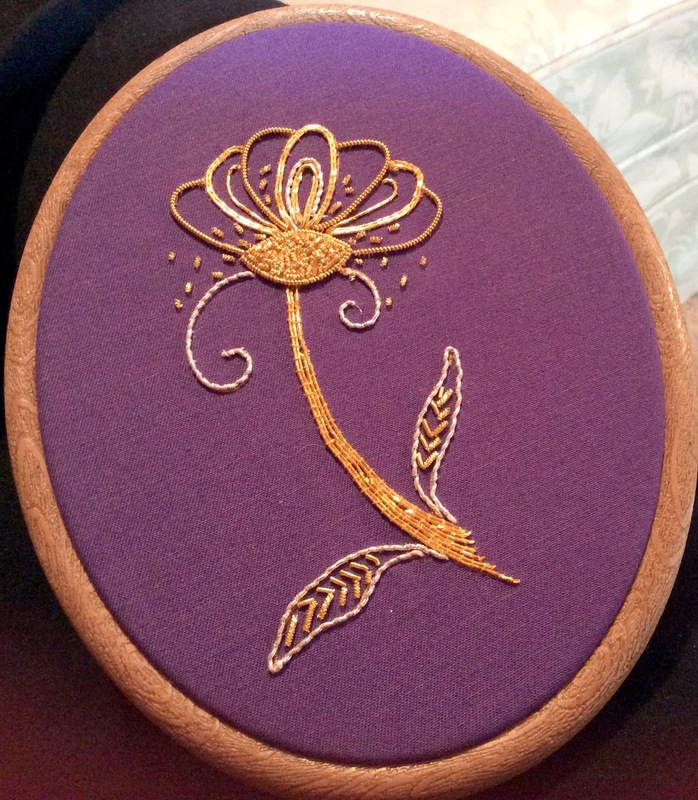 My first attempt at goldwork (2018)! Maybe it is the rhythm of the needle that is prayer to me. 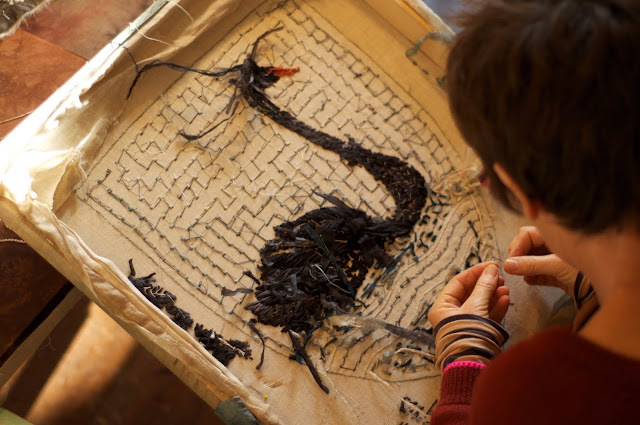 Certainly I have seen its calming effect on retreatants during textile art retreats that I have facilitated for the Creative Arts Retreat Movement. Maybe it is my own need to piece together the broken that drives me. Maybe I am stitching my fractured soul together. But, for me, patchwork is prayer, and I am so grateful to those who have helped me to this realisation. Maybe it is ‘only patchwork’, ‘craft not art’, but patchwork has taken me to places I would never have dreamed of visiting. It has given me friendships that I will always value, and truly for me is ‘peace work’. Washed-up! (work in progress 2018) wall-hanging. 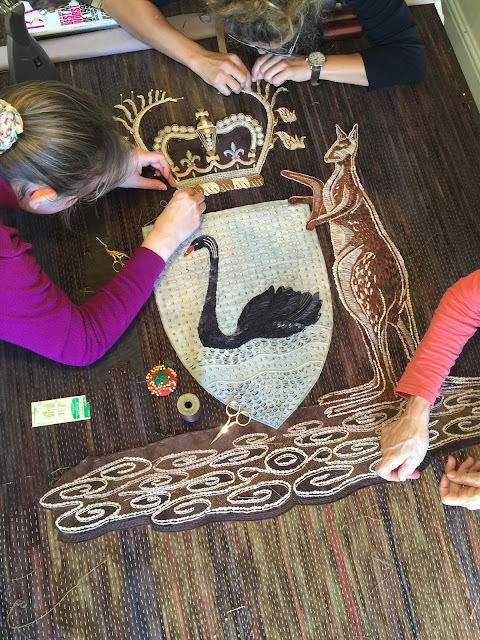 At $57,000 Aus it wasn’t a big art commission by local standards, but as the Coat of Arms placed in the Ceremonial Court of the new Western Australian Supreme Court (Civil), it was an important one to get absolutely right. The new Supreme Court Civil is part of an expanded redevelopment of Cathedral Square in the centre of the Perth Central Business District, incorporating the restoration of the beautiful, historic Old Treasury Buildings into what is now the award winning Como The Treasury Hotel. The aim of the State Government was to preserve and transform a grand and elegant heritage asset from a derelict empty building in a rundown precinct to a world-class yet publicly accessible hotel. They succeeded, the award winning restaurants and bars in this beautiful building are packed every night with the after work crowd. This restoration became the centre of a designated Legal Precinct. An elegant, minimalist high-rise office block was built behind the hotel to house the Supreme Court (Civil) and Mediation Services, and the Departments of Justice and Treasury. As part of the State Government Percent for Art Scheme, site-specific art commissions were already underway for these new offices and courts when the Chief Justice suggested one more. 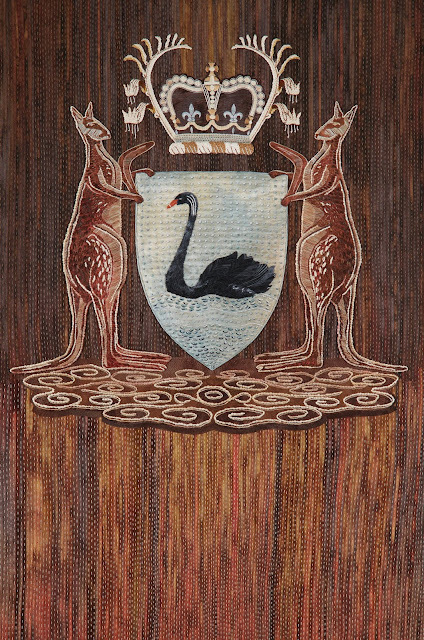 He had seen a tapestry Coat of Arms, albeit old and falling apart, in another Australian State’s Supreme Court and thought we should have something similar. 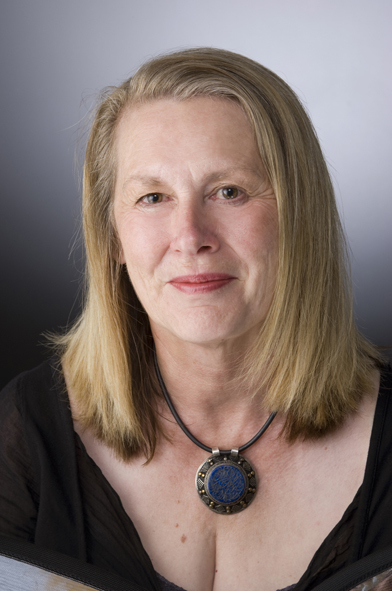 Another Supreme Court Judge, who has an interest in the local art scene, took over the project. He and the Executive Manager of the Supreme Court were a pleasure to work with. It was an act of great faith and trust for them to commission Trish Bygott and Nathan Crotty as neither had any previous experience with public art projects and Trish’s embroidery work is completely process driven so they could only present a loose and imprecise concept when they pitched for the project. Nathan Crotty is Trish’s partner in life and art. He contributed to the overall design and more difficult aspects of project management that required lateral thinking. From their shop selling hand-stitched clothes in Fremantle, (the port suburb and artists’ hub of Perth), they have gathered a group of like-minded passionate stitchers to give workshops and seminars on embroidery and associated crafts. When the Chief Justice came up with the idea for an artist made Coat of Arms, it was only nine months away until the official opening of the Court, but because it was public money precious time was taken up with a formal commissioning process, asking three other artists to submit proposals as well. This meant that Trish and Nathan’s production time after being awarded the commission was reduced to just over 6 months. 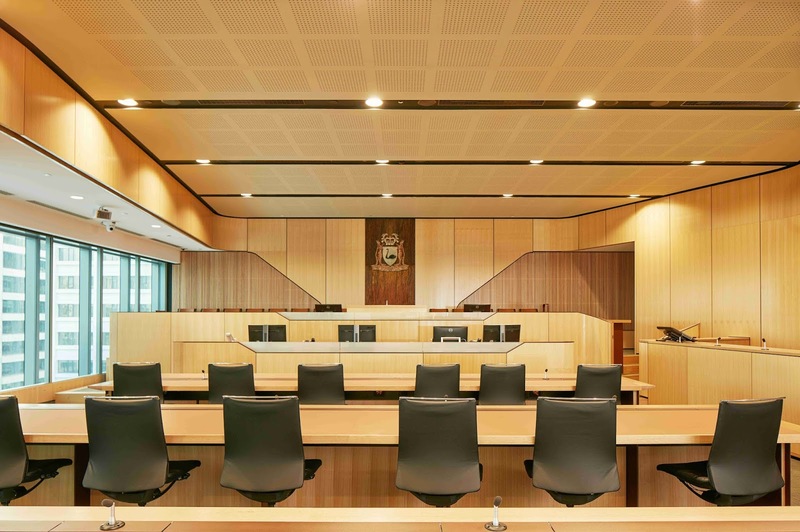 The Coat of Arms is governed by strict rules, yet Trish and Nathan were asked to be innovative, celebrate the skill of the hand made, and work within a 21st century sensibility that would complement the modern interior of the Ceremonial Court. The only flexibility afforded them was they did not have to place the iconography within a rectangle, circle, or oval unless they chose to. What they did have to think about carefully was the hue, tone, and vertical emphasis of the wooden panelling that dominates the interior. Trish, Nathan and their team performed the miraculous and managed to complete the minutely detailed embroidery on time and ready for the official opening. When the State and Judiciary of Western Australia were founded any Indigenous perspective was completely denied. The symbols we are left with for the most part reflect outmoded sentiments around this division. It was important to Trish and Nathan to correct this in some way, no matter how subtle. They contacted respected Noongar Elder Dr. Noel Nannup, who graciously shared his wisdom. Although many of the symbols within the crest do not sit well with Noongar people, Noel talked about the significance of the Sheoak tree as a natural and living symbol of justice for his country and culture. Uncannily yet appropriately the filament-like leaves of this tree have a stitch-like appearance. 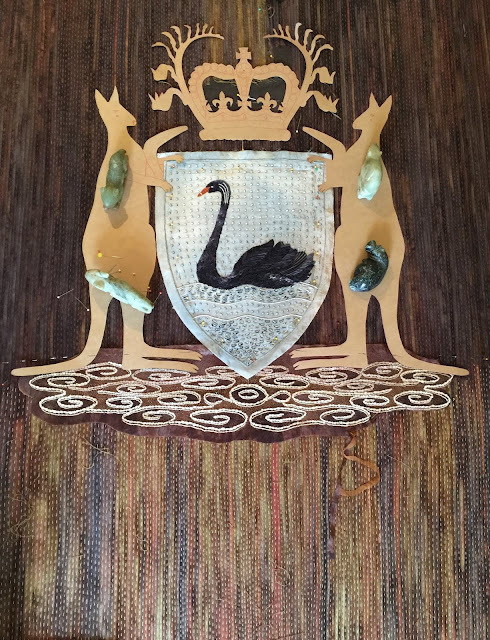 This information was crucial as it allowed the essence of Noel’s narrative to consciously enter the new Coat of Arms and infuse every aspect of the process, embedding a deeper layer of meaning and sensitivity into every colour and stitch within the work. Before starting on the embroidery Trish tested numerous samples inside the Ceremonial Court to confirm that proposed stitch sizes could be seen at a distance while still maintaining a sense of intimacy. Silks and threads hand dyed in natural and reactive dyes were placed against the wood to ensure each complemented the other yet allowed the embroidery to stand apart. Everything had to be drawn to scale because the drawn marks determined the stitch size. 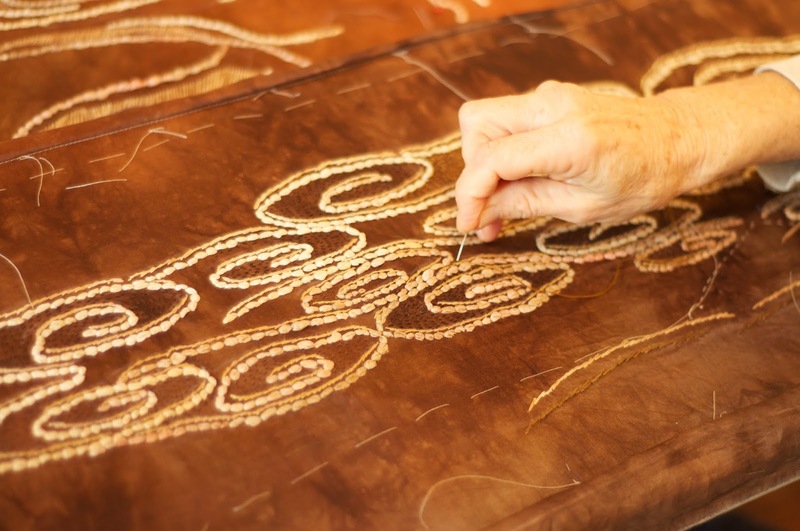 Once this process was resolved Trish engaged two expert embroiderers to work with her. Each took on responsibility for individual parts of the whole work. Before commissioning the artwork, the architect had designated leather as the background material for the Coat of Arms. However, to ensure overall aesthetic cohesion Trish and Nathan decided to replace this with textile created from thin strips of torn silk hand dyed in nuanced shades of earth and amber. 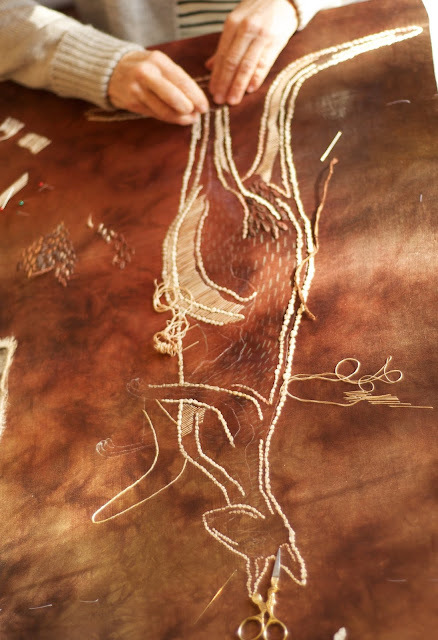 Each strip, meticulously folded to ensure no raw edges were revealed was laid down held was laid down and held in place with and estimated 40,000 minute running stitches. At over 2m in length the background was hard to handle and their first attempt was thwarted because the fabric was distorting. 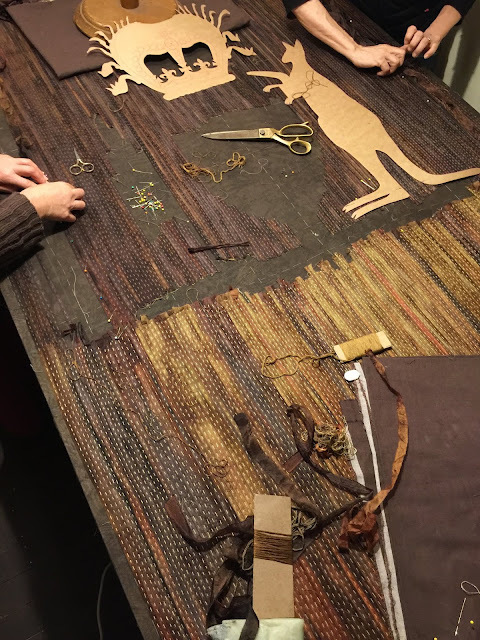 Textile artist, Jane Donlin, who was working on the project with Trish and Nathan suggested the strips had to be held tight like a warp of a woven cloth Overnight Nathan made a special frame on table legs while Trish and Nicky Desmarchelier, another textile artist who was responsible for stitching the background, unpicked their work to start over again. All of this added to stress and adrenalin levels. 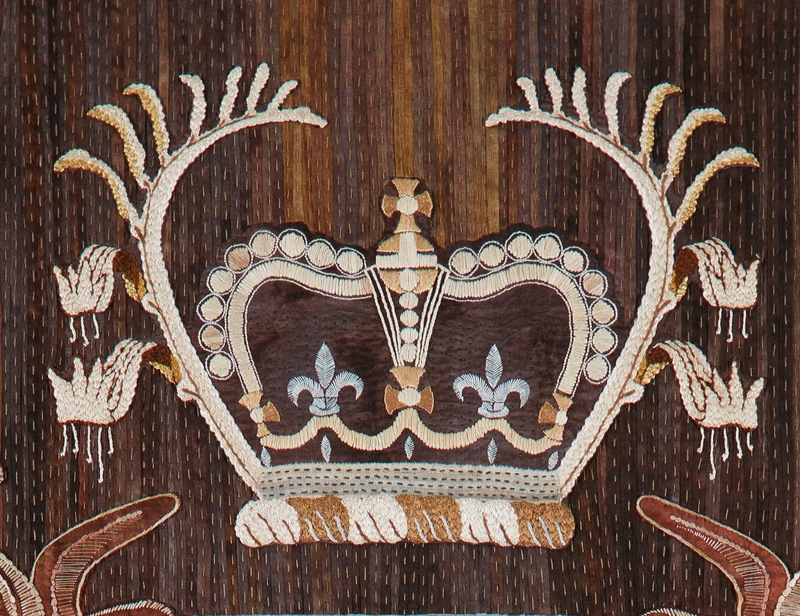 The kangaroo paws, kangaroo, fleur-de-lis, water, and crest with the swan were embroidered separately, cut out and appliqued onto the background. Trish had to design around stitches that would allow for the body of each element to be easily cut and turned. The ground of spirals below the kangaroos give the work a three-dimensional feel. Trish engaged a textile conservator to mount the finished work. The architect provided the original backing board for the leather, but it is MDF (medium-density fibreboard), which is definitely not acid free. To rectify this Nathan had to glue a thin layer of rag board to the MDF to act as a barrier between the acids and the finished work. 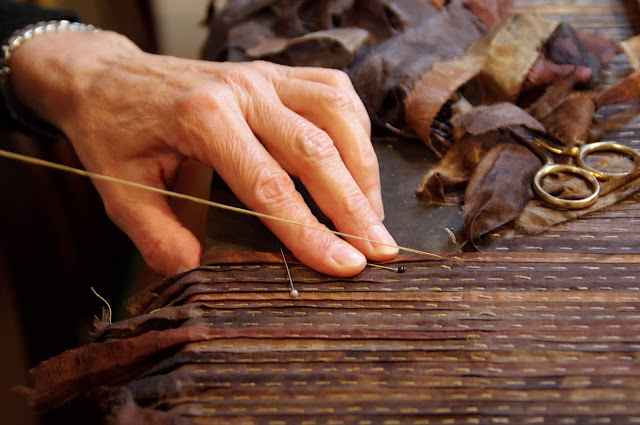 Then it was wrapped with a layer of bamboo wadding, and covered with another layer of de-ionised linen. Only after all this preparation could the artwork be mounted. Everything was measured very precisely. 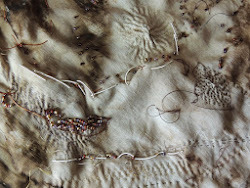 The completed artwork was stitched onto the linen which already had Velcro stitched on to hold it under the board. The four corners had to be very carefully mitred. This final mounting turned out to be an all night task right up until the van came to take it into the Court at 11.00 am. ‘The whole process was so intense from start to finish’, Trish said ‘no matter how careful our planning, we still had to make on the spot decisions every day. It was a balancing act because even though we knew we were working against the clock to a strict deadline, nothing could be forced and we had to allow each and every part to come together at the right time. After the artwork went up in the court, we all went through a strange phase of having withdrawal symptoms. We were all so exhausted yet didn’t know how to relax, sleep or conversely how to fill our days’. 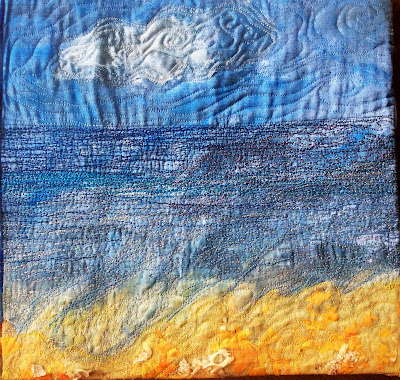 Water: ripped silk held down with running stitch, ripped silk backstitch. The artist would like to thank the Western Australian Government Department of Finance and Rob Bygott for their support in making the video. ‘Coat of Arms Embroidery’.
. The Noongar are the original Indigenous inhabitants of south-west corner of Western Australia. They have inhabited this area for more than 45,000 years. Their traditional lands include the metropolitan area of Perth, Western Australia’s capital city.
 . A species of the Casuarina genus, native to Australia, the Indian Sub-Continent, South east Asia, and the Pacific Islands.
. This paragraph has been extrapolated and slightly re-worked from an article by Nathan Crotty for the Fremantle Shipping News.
. The common name for a number of plant species found in the south west of Australia so named because the tubular flowers are coated with dense hairs and open at the apex with six claw-like structures. The red and green kangaroo paw is the official floral emblem for Western Australia. One day I noticed the marks in my tea cup. The residue - memories of the experience of a cup of tea. These चाय के दाग or tea stains, were evocative and made me think of the 'stains' in my mind - memories of when I couldn't be what I thought I was and when I was what I'd never thought myself even capable of being. And through these चाय के दाग [tea stains] began that journey of endless questions: Who, What, Why and Where am I ? This Stitch Journal is a visual record of the journey of a mind exploring itself, through the language of stitch.